Nearly 75 years ago, Nobel Prize-winning physicist Erwin Schrödinger wondered if the mysterious world of quantum mechanics played a role in biology. A recent finding by Northwestern University's Prem Kumar adds further evidence that the answer might be yes. Kumar and his team have, for the first time, created quantum entanglement from a biological system. This finding could advance scientists' fundamental understanding of biology and potentially open doors to exploit biological tools to enable new functions by harnessing quantum mechanics. "Can we apply quantum tools to learn about biology?" said Kumar, professor of electrical engineering and computer science in Northwestern's McCormick School of Engineering and of physics and astronomy in the Weinberg College of Arts and Sciences. "People have asked this question for many, many years—dating back to the dawn of quantum mechanics. The reason we are interested in these new quantum states is because they allow applications that are otherwise impossible." Partially supported by the Defense Advanced Research Projects Agency, the research was published Dec. 5 in Nature Communications. Quantum entanglement is one of quantum mechanics' most mystifying phenomena. When two particles—such as atoms, photons, or electrons—are entangled, they experience an inexplicable link that is maintained even if the particles are on opposite sides of the universe. While entangled, the particles' behavior is tied one another. If one particle is found spinning in one direction, for example, then the other particle instantaneously changes its spin in a corresponding manner dictated by the entanglement. Researchers, including Kumar, have been interested in harnessing quantum entanglement for several applications, including quantum communications. Because the particles can communicate without wires or cables, they could be used to send secure messages or help build an extremely fast "quantum Internet." "Researchers have been trying to entangle a larger and larger set of atoms or photons to develop substrates on which to design and build a quantum machine," Kumar said. "My laboratory is asking if we can build these machines on a biological substrate." 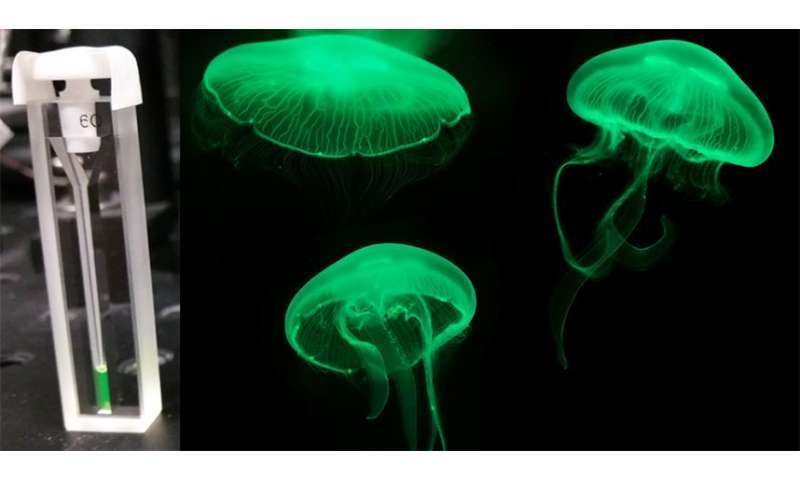 In the study, Kumar's team used green fluorescent proteins, which are responsible for bioluminescence and commonly used in biomedical research. The team attempted to entangle the photons generated from the fluorescing molecules within the algae's barrel-shaped protein structure by exposing them to spontaneous four-wave mixing, a process in which multiple wavelengths interact with one another to produce new wavelengths. Through a series of these experiments, Kumar and his team successfully demonstrated a type of entanglement, called polarization entanglement, between photon pairs. The same feature used to make glasses for viewing 3D movies, polarization is the orientation of oscillations in light waves. A wave can oscillate vertically, horizontally, or at different angles. In Kumar's entangled pairs, the photons' polarizations are entangled, meaning that the oscillation directions of light waves are linked. Kumar also noticed that the barrel-shaped structure surrounding the fluorescing molecules protected the entanglement from being disrupted. "When I measured the vertical polarization of one particle, we knew it would be the same in the other," he said. "If we measured the horizontal polarization of one particle, we could predict the horizontal polarization in the other particle. We created an entangled state that correlated in all possibilities simultaneously." Now that they have demonstrated that it's possible to create quantum entanglement from biological particles, next Kumar and his team plan to make a biological substrate of entangled particles, which could be used to build a quantum machine. Then, they will seek to understand if a biological substrate works more efficiently than a synthetic one. "Researchers, including Kumar, have been interested in harnessing quantum entanglement for several applications, including quantum communications. Because the particles can communicate without wires or cables, they could be used to send secure messages or help build an extremely fast "quantum Internet." That's what I've read too. Robust correlations without communication brings us into a strange new world in which we are somehow inside the experiment. Maybe the article is referring to ordinary less-than-lightspeed communication made simpler by the use of entanglement. Or something. Yeah, I dunno. I've read about superdense coding and quantum encryption, but they use cables and slower than light communication. The transfer of energy in the photosynthesis process as well as the mechanics of taste and smell in the human body. I might have the wrong end of the stick but that's the impression I have from some faint recollection.